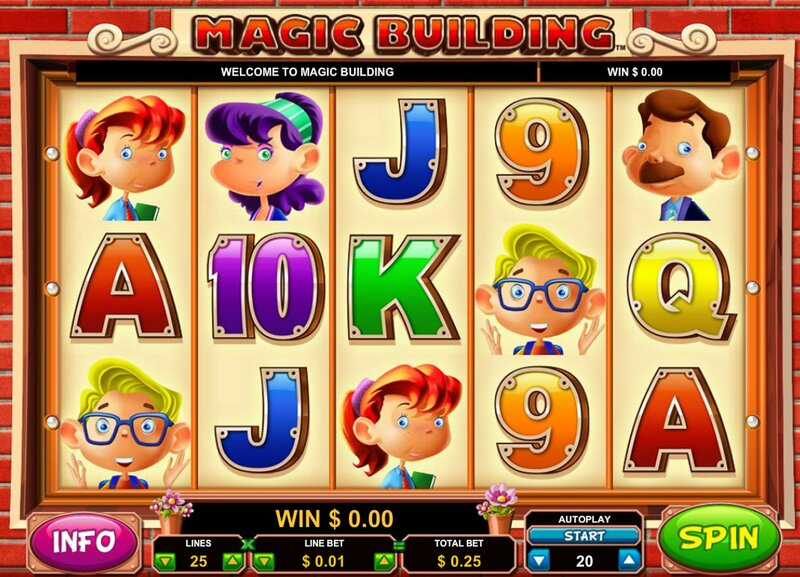 Not as outright wacky as some of Leander’s other online video slots, this 5 reel, 25 pay-line slot – Magic Building - is nevertheless diverting enough, even if the game’s one bonus round rarely hits and offers little in the way of thrills. Well, if you’re familiar with Sheriff Gaming’s quirky sci-fi comedy-fest, The Robets, you should get the idea. 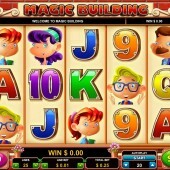 A comedy-themed slot set in an American apartment block, the reels in Magic Building feature a jolly family comprising a Mum, Dad, girl, boy and dog, plus regular 9-through-Ace symbols. The doorman icon acts as the game’s Wild symbol, substituting for all regular symbols other than the Bonuses and Scatters. Five Wilds across the reels pays out a 1,000x line bet jackpot. The “Crazy Elevator” Free Spins Bonus is triggered when you hit three or more Elevator Scatters on the reels in any position. Depending on how many Scatters you land you will win 10, 15 or 30 free spins. Check out the Elevator that’s lurking on the left-hand side of the screen during the bonus spins round. After every free spin, the Elevator on the side of the screen will open its doors. The symbol inside the Elevator works as the first symbol on any winning pay-line, effectively giving you a random Wild on every spin. This is a great feature but spins can’t be re-triggered, sadly. As I mentioned at the top of the review, if you’ve played The Robets, you should enjoy this – it’s original, has Leander’s customary slick gameplay and graphics, and certainly makes a change from the usual online slots fare. If you’re after something else along the same lines, check out another slice of Sheriff family fun – The McMurphys.